Hey everyone! My name is Logan and I have been smoking for about two years now. Started with a cheapo little pear hookah, upgraded to a Starbuzz Unicus, and now I am smoking out of a generic KM Ice Bucket. Some of my favorite brands and flavors are AF Mint, Nakhla Twin Apples, Fumari Spice Chai, and Fantasia Magic Dragon. Welcome to the forum Logan. Are you sure it is just a generic KM ice hookah? 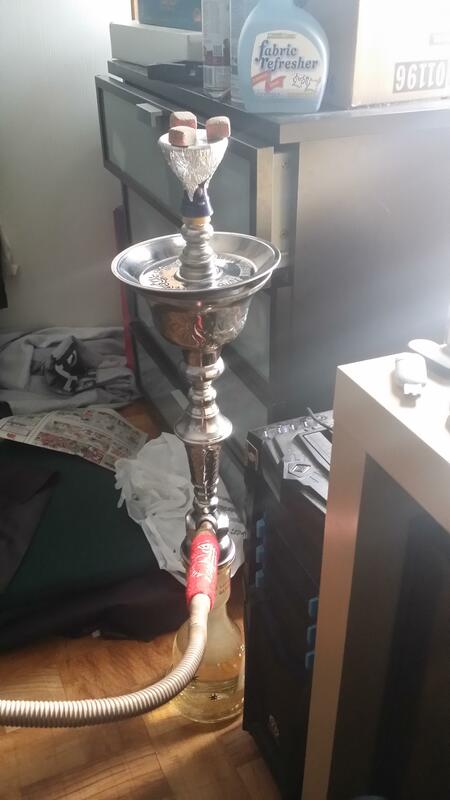 You should upload a picture of it here, or look at hookah-shisha or some other vendor with a large catalog of KMs to determine what model it is, or is closest to. Looks like the World Cup model to me, but it is missing the copper/gold accents. Yeah that is the model that was copied after a Nour trophy chiller which originally had the golden accents around the trophy part. Km's version always has the silver look without any gold on this particular model. It should be called something like the KM trophy chiller, the world cup is a bit more extravagant and expensive. Nonetheless you have a fantastic hookah there. Welcome to the forums Logan. I have a soft spot for any "Michigander" because I lived there for a while. I graduated from Monroe High School and I loved it there. Is that a KM hose you are using? it looks like the one with the foam handle which I love the look but the reviews I saw said that they weren't very sturdy so I didn't get it. What is up fellow michigander! My whole family is from the lapeer area. If you close by auburn hills you must try grizzly hookah lounge (about 2 miles from the palace) one of the best loungest ive ever been too. No way man, I have friends who use to live up in Lapeer. I work at OU and I know where you are talking about. The best place is down in downtown Auburn Hills called Fuego. They take care of you above and beyond any place I have been to yet, plus you can choose from their selection of hookahs. yeah that's what I've heard about the glue and that particular hose. I still like it a lot though. The hose should be fine. our own Doug has a KM and a dream house that is much like the Lavoo and he uses it with no problems. I had family only in Monroe and they were glad when they moved to Miami. They said that Michigan is always gloomy with grey skies and you never get to see the sun. To me it was a different experience because the most important years of my teenage life were spent there before I moved to dirty jersey. yeah I might have to go next year because one of my friends that never left Michigan is getting married and I'm invited. I thought I was going to go last year for our high school reunion but I missed it. I would love to see the town again where I had the best time of my teenage years. Neither....Red which was the Trojans color. I'm not into sports AT ALL which i'm assuming is what you are referring to for team colors.... right?